6 March 2019, LONDON – An award-winning Scottish artist who began her career as a single mum has won a major national art prize with her tribute to single parenthood. 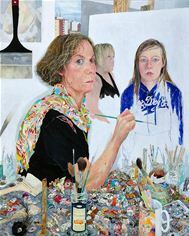 Jennifer McRae from North Berwick was last night named as the winner of the 2019 Lynn Painter-Stainers Prize for her portrait of three generations of women in her family: her granddaughter, her daughter and her. The painting, Past, Present and Future: Tracing the Female Line, wins McRae £20,000 and a gold medal. Reacting to her win at the Mall Galleries in London, Jennifer McRae said: “The drinks are on me! To win the Lynn Painter-Stainers prize is very special. I’m going to ring my family with the news right now. When I started, my daughter was one of my main models. Now my granddaughter is. It’s a natural progression. McRae, who is now married, is a member of the Royal Scottish Academy and has had her work displayed in the Scottish National Portrait Gallery and the National Portrait Gallery. She has painted many well-known figures include Sir Chris Hoy, Dame Judi Dench, Baroness Gail Rebuck and Kirsty Wark. Second prize of £4,000 went to Lara Cobden from Norwich for The Winterkeeper’s Cabin. The Lynn Painter-Stainers Prize is the UK’s highest-funded annual art competition for representative and figurative art – art based on the real world. Other winners on the night were Charlie Schaffer from Brighton, who won the Brian Botting Prize for figurative art, worth £5,000, and Ewan White from New Malden, who was named Young Artist, also worth £4,000. The Daphne Todd Prize for £2,000 went to James Lloyd from North London. The Lynn Painter-Stainers competition is open to any artist resident in the UK painting or drawing works of representational or figurative art and over 18-years-old. 81 artists were shortlisted for the prize out of 1,191 who entered this year’s competition. This represents the highest level of entries in the prize’s 14-year history. Created in 2005 by The Worshipful Company of Painter-Stainers and The Lynn Foundation, the competition champions the skill of draughtsmanship and figurative painting. The exhibition aims to reflect the breadth of approaches and materials from across the artistic spectrum. The Lynn Foundation is a charity devoted to children, the disabled, music and the arts. Its contribution is the prize money totalling £28,000 and an engraved gold medal for the winner of the first prize. Based in London, The 4C Hotel Group manages and develops hotels in business centres and leisure hot spots across the UK, Middle East, Africa and Canada. Working with international brands including Holiday Inn, Holiday Inn Express, Comfort Inn, Easy Hotel and Double Tree by Hilton, their vision is to become the market leading hotel operator and developer. Rigby & Rigby is one of the leading developers of super-prime property in some of the world’s most exclusive destinations. Its name has become synonymous with inspiring architecture and striking interiors, combining state-of-the-art technology with traditional craftsmanship to reach a level that is unsurpassed in the industry. At the forefront of luxury property design and development management, Rigby & Rigby delivers unrivalled homes from concept to completion. The company’s full-service capabilities span across development management, architecture (RIBA), interior design (BIID & SBID), construction and private client services to create the most exceptional properties in the world. Helen Green Design was founded in 2002 to create the most exceptional homes in the world and is proud to be one of Britain’s most respected interior design practices. Over the past years, Helen Green Design Studio has developed an invaluable reputation for creating elegant, sophisticated interiors for private clients, including prestigious developments and projects in the luxury hotel market.